We keep talking about moving to the country. I don’t think it’s going to happen anytime soon; I’m starting to wonder if it ever needs to happen. How would our lives be different if we lived in the country? What would we do, that we don’t do now? Raising lots of different fruits right in our yard? Photographing butterflies and bees on wildflowers? 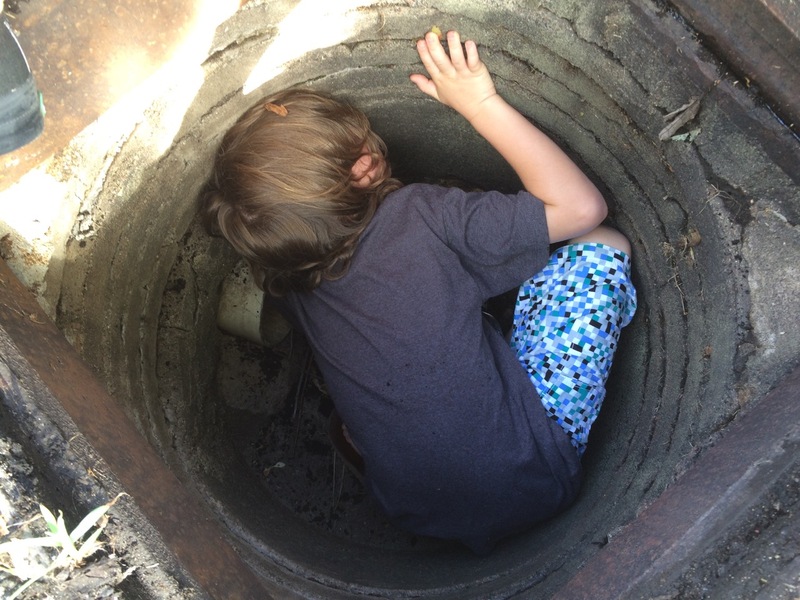 Rescuing baby ducks out of a storm drain? Do they have storm drains in the country? It was pretty satisfying seeing that Mama duck waddle away with all 7 babies in tow after our exciting experience which included lowering my child into a storm drain and stopping traffic on Cedar Avenue…for…ducks. Anyway, we went to Isle Royale National Park in June, after talking about it for approximately 20 years. It was everything I had dreamed it would be; my life-long moose drought ended with seeing three actual moose in the wild. It was wonderful. Three weeks later we went on an impromptu trip to Blue Mounds State Park, in the very opposite corner of our state. 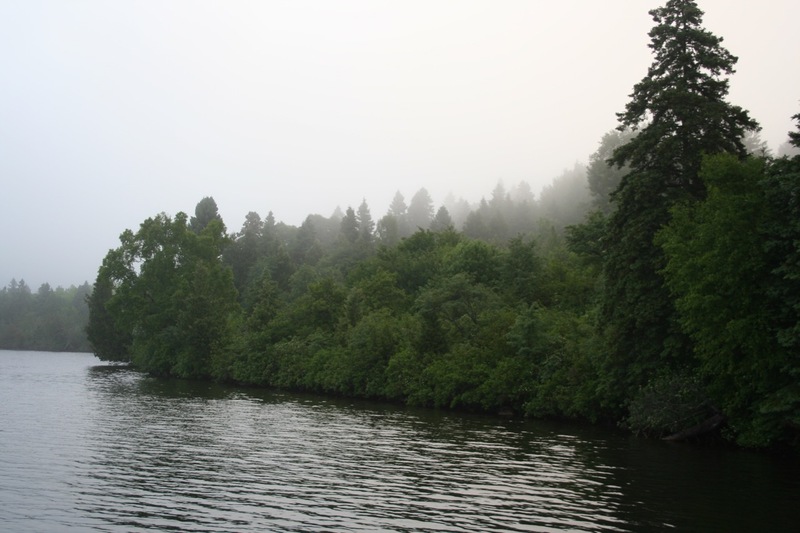 From the boreal forest to the prairie—there is so much to love about both of these biomes. In my fantasy world of moving to the country, I find some acreage that includes both of them. The kids surprised me by emphatically declaring that they preferred Isle Royale, but I had to point out that Blue Mounds was a significantly cheaper and easier trip. When we go on these trips, I always take obnoxious numbers of wildflower photos. Isle Royale was covered in thimbleberry plants, which were new to me. A member of the rose family, they get a bright red, raspberry-like berry later in the summer. 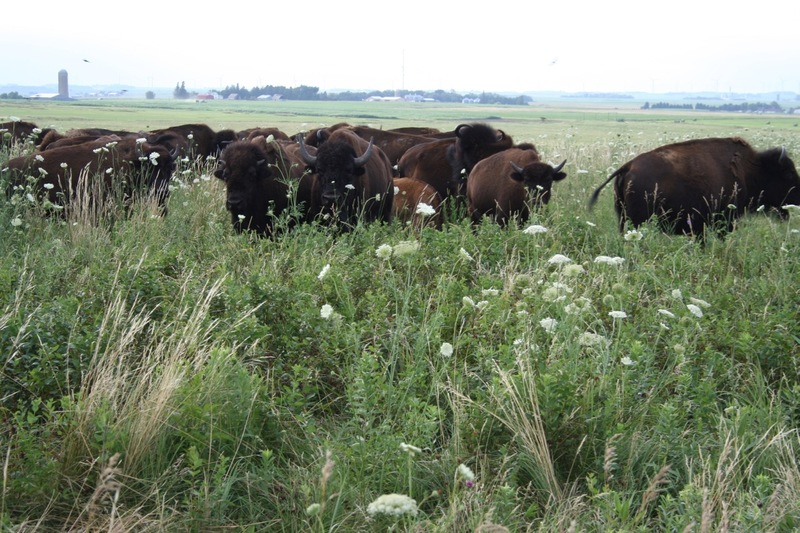 A little research upon our return told me that Prairie Restorations, a local native plant nursery, stocks these! I’m going to try them next year in a new mixed bed I am planning. 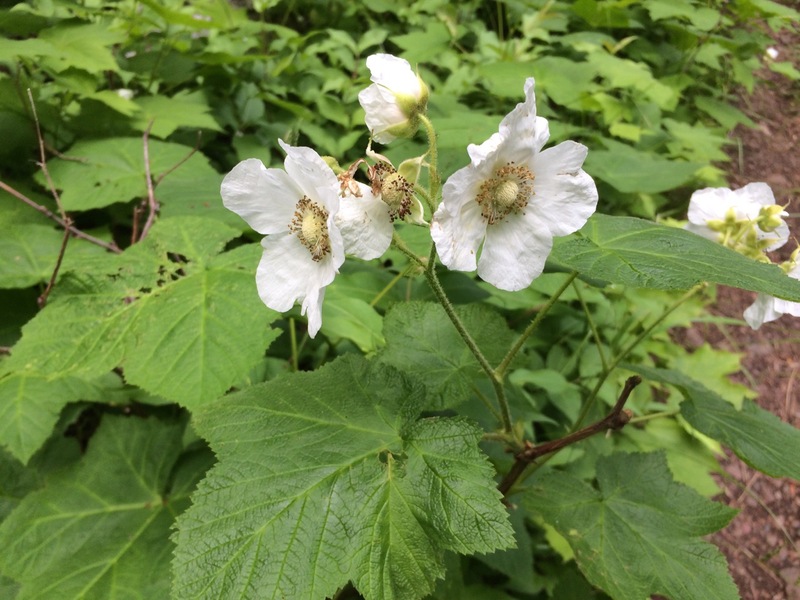 I will be sure to find out first whether they require acidic soil; I frequently saw them next to Bunchberries, which do require acidic soil and failed to thrive in my yard. A friend got married two weeks ago, and I was able to provide a beautiful bridal bouquet for her from my yard! Fortunately she’s not the kind of person to mind if a few bees were buzzing around her bouquet. Two years ago, we added this trellis above our deck. Last year, I planted hops and grapevines around it, and this year the plants really got established and started actually providing us with mid-day shade. However, the deck/arbor are on the west side of the house and the setting sun is still intense around supper time. We added this sun shade to the arbor, and the sense of privacy and shade have been great. Plus: we’ll get our first real hops harvest this year. Adam wants to brew one batch of fresh hops beer, then I hope to barter the rest to a brewing neighbor in exchange for a growler of the finished product. Next year, perhaps, we’ll get our first real batch of wine grapes. Harvest season is in full swing. Above, jalapeño and sweet banana peppers ready for pickling. I’m growing my peppers all in pots this year, scattered around the sunniest parts of my flower garden. This could end up being a permanent change. Next, my garlic. 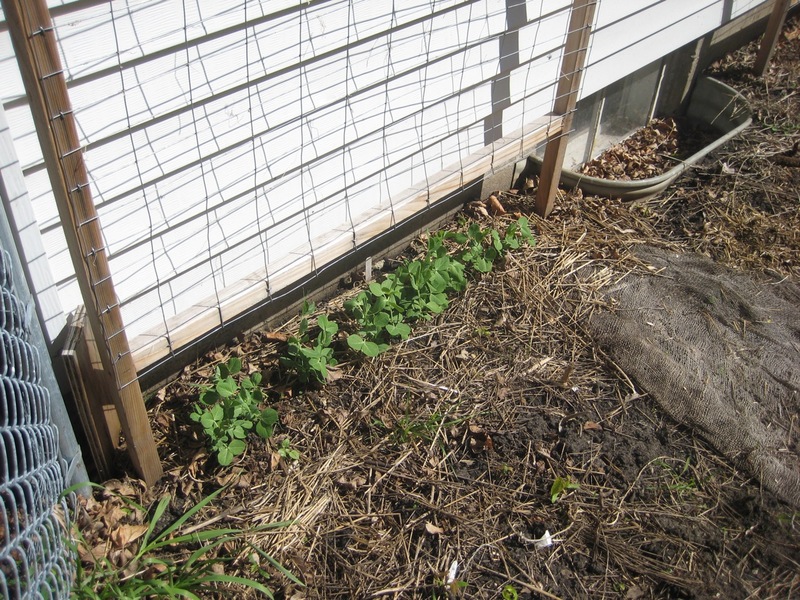 I had an epiphany last fall: WHY was I using up several square feet of my precious little fenced vegetable garden space for a food that rabbits *don’t* eat? So I planted garlic cloves all over my flower beds in the fall. They all came up, and that was great, but unfortunately many of them got shaded out by taller plants as they were maturing. As a result, my bulbs are rather small. I’m still happy to have them, though. 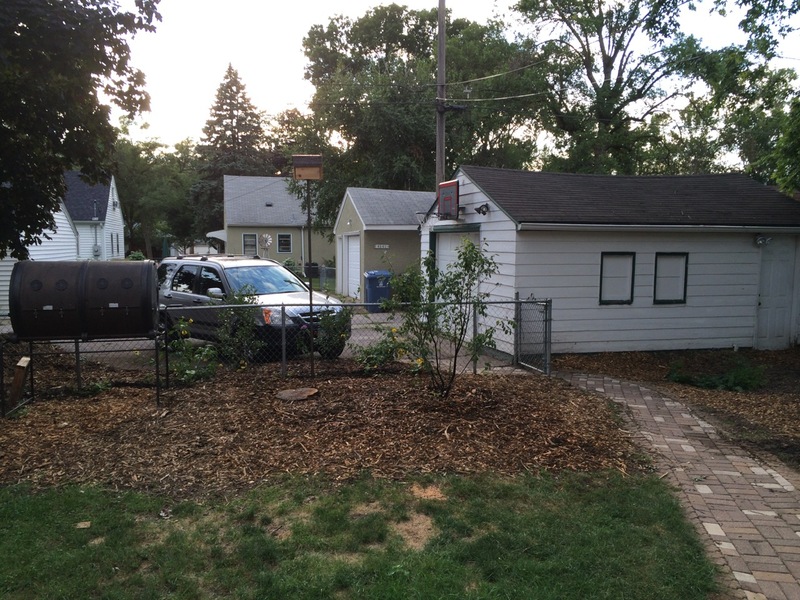 I love the home and yard we’re creating here in South Minneapolis. So maybe I should spend some time enjoying it rather than wonder if I’m missing out on anything. How is your summer harvest going? 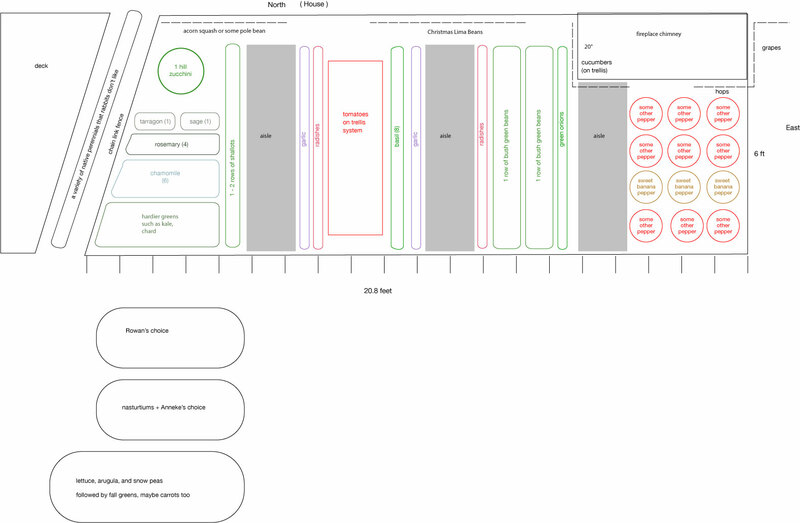 Categories: Community planning, Gardening, Permaculture, Practical, Theoretical | Tags: companion planting, edible landscaping, garlic, landscaping, native plants, Permaculture | Permalink. It doesn’t seem like that long since we planned and mostly executed Crazy Garden 2014. I’m afraid I don’t have a name for our 2015 garden; the closest thing I have to a concept is to call it “keeping it simple 2015,” because we have A LOT to plant this year. For starters, is that an herb spiral? Why yes it is. I’ll talk a little more about that later. For our home vegetable garden, I haven’t marked out specific varieties of vegetables I want to grow; this year I’m going to use up a bunch of leftover seed. I’ve also got a huge network of gardening friends now–I end up getting phone calls in May about finding a home for large flats of onions and the like, which benefits me if I’m not too picky. I’ve reduced the amount of space allocated to each pepper plant this year. It may just be that we’ve had two cool, not-good-for-pepper-growing summers in a row, but they’ve seemed like they had plenty of extra room. I’m also planning on more onions. We’ve come to love having fresh ones around all summer. The only other real change I’m planning this year in this garden is that I’m not going to plant any of my beloved large-size heirloom tomatoes. It’s not worth the heartache when you have a plant that only produces a handful of tomatoes and 3/4 of them are taken by squirrels (who eat one bite). I’m going to grow mostly cherry tomatoes, some tomatillos, and maybe something else very small. The purple lines on here represent where I *think* I planted garlic last October. I didn’t draw a diagram at the time, and I’ve completely forgotten. So, onion rows may move around a bit depending on where I actually see garlic in the spring. Parsnips are also making a glorious return to my 2015 garden after being absent a few years. I do love them so. 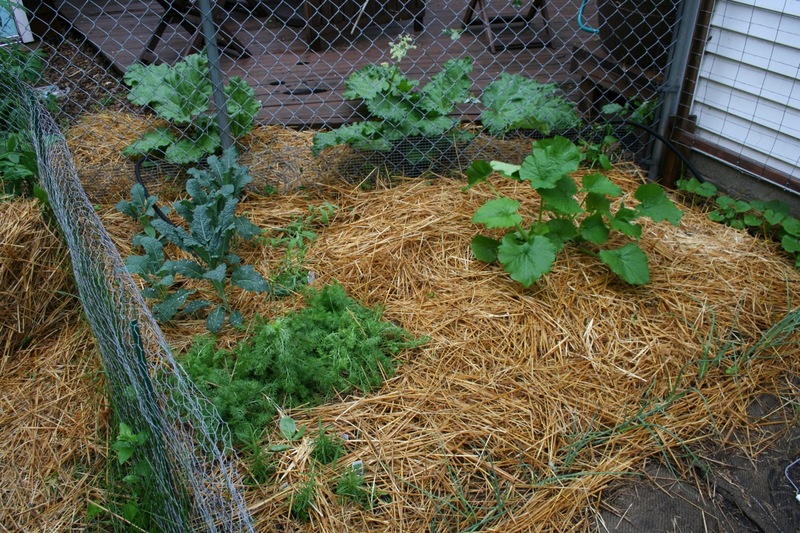 Notice the strategic layout of my “root vegetable area” on the right side of the garden. Carrots are in front, where the will-be-8-year-olds can easily dig them up and eat them. Behind them are the slower-growing beets, and in the very back, hard-to-reach area are the parsnips, which we won’t harvest until everything else is done anyway. 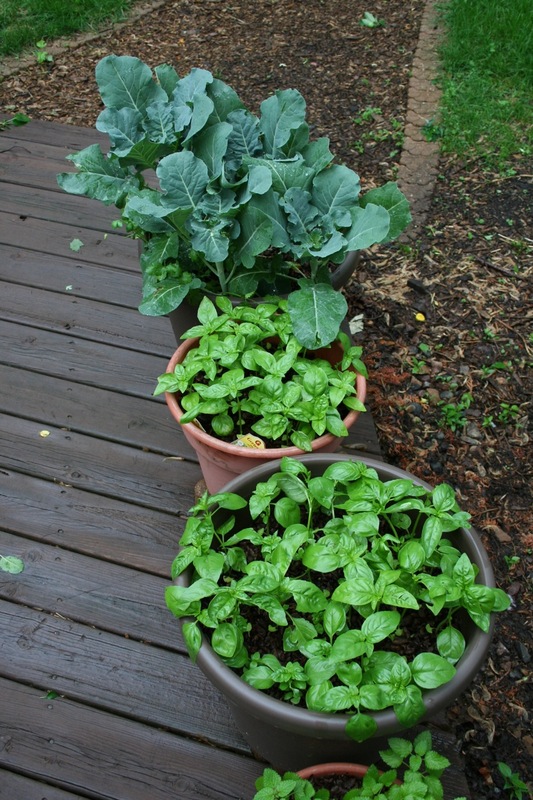 Small space gardening requires strategy. At Sabathani, we’ll be focusing on volume again, probably dedicating most of the garden to potatoes and squash or pumpkins. Rowan got a free packet of broom corn, so that’s being added as well for fun. 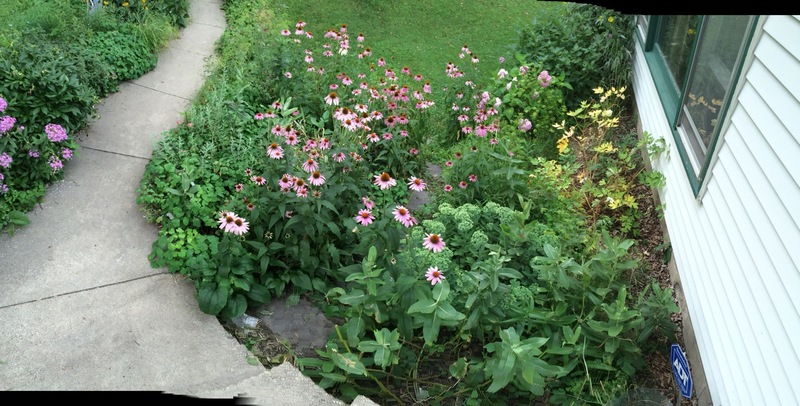 Here’s a panorama of the garden in front of our living room picture window. It’s a little overgrown–can you even see the flagstone path that’s supposed to be going through there? The mail carrier has certainly given up on using it. On the right side of that path, which is currently occupied by an old Autumn Joy Sedum that desperately needs to be divided, I’ll add a currant bush. On the left side of the stone path (right side of the main sidewalk) is where I want to put my herb spiral. I hope it will give a slightly more formal look to this area while also giving easier access to herbs. We love growing herbs, and when we first got started we used to mix them in with all of our perennial flowers here in the front yard. Well, the thing is, when you plant natives they tend to move around and fill in open spaces. Our little thyme, oregano, cilantro, and parsley patches didn’t really stand much of a chance (dill’s holding its own though). 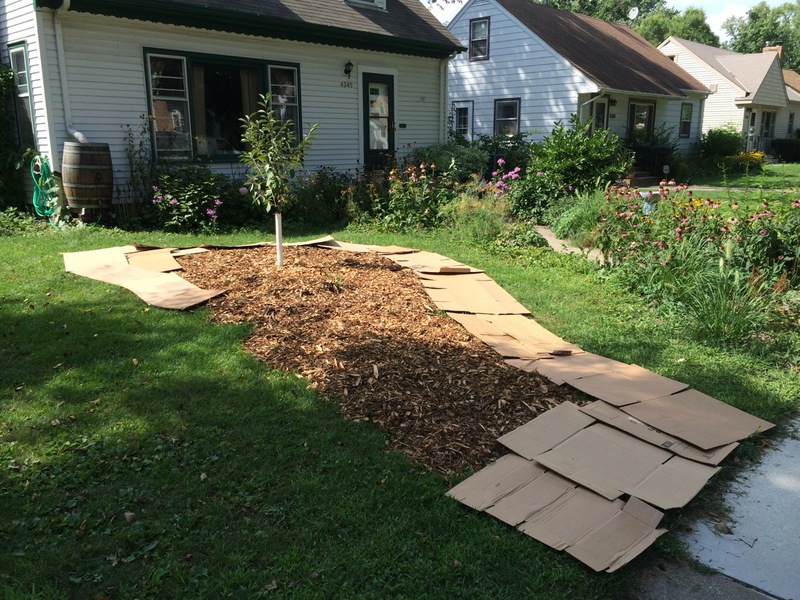 Our new Cherry Tree garden, which we sheet mulched last fall. Should be in perfect condition for planting by the time May rolls around. In addition to divided perennials from around the yard, I’d like to add another currant bush (bringing our total to 3), an old-fashioned rose bush (so that I can make rosehip tea) and another non-fruit bearing native shrub closer to the boulevard. With the number of dogs walking by on our sidewalk, I’d rather not eat fruit that grows *right* next to it. 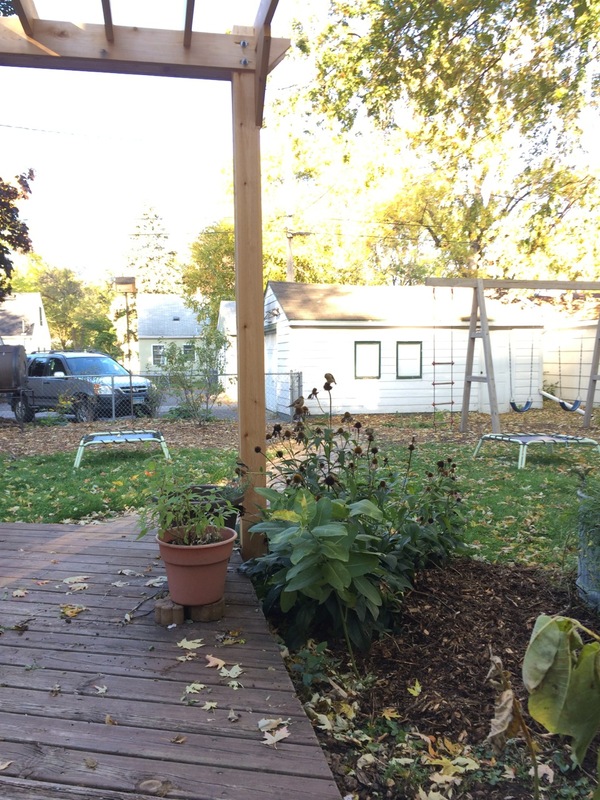 Moving to the back yard, we put up a beautiful new arbor over our deck last August. This spring I’d like to plant two grapevines to climb up over it, and I’m also going to add some hops on a wire system on the north side. I’m hoping this gives us a little bit of privacy on the deck. 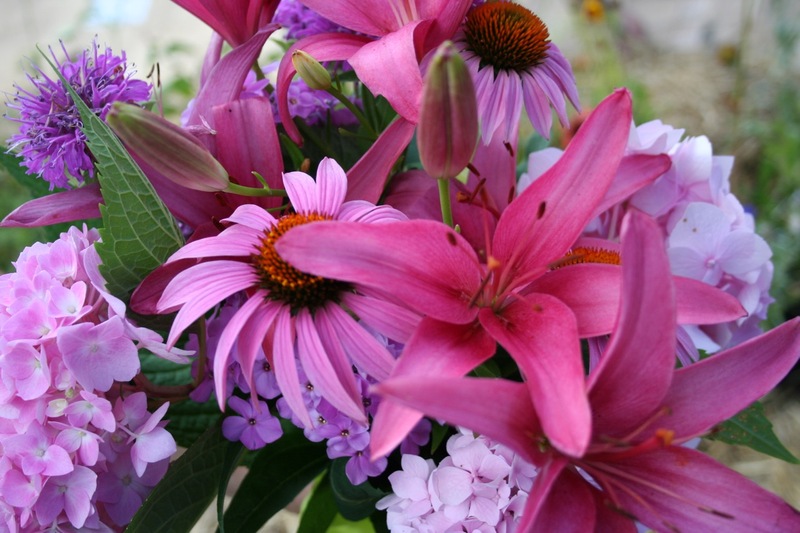 These echinacea and milkweed can probably stay as well. Finally, the barest-looking spot in the garden: the area formerly occupied by our very large, fire blight-infested apple tree that we had to cut down in the fall (stump still visible). We quickly planted a Serviceberry bush. They’re supposed to get quite large, but we will want to fill in a little bit around it too. I’m thinking 2 more gooseberry bushes (bringing our total to 3) and something on the corner by the gate… I have not decided what, yet. 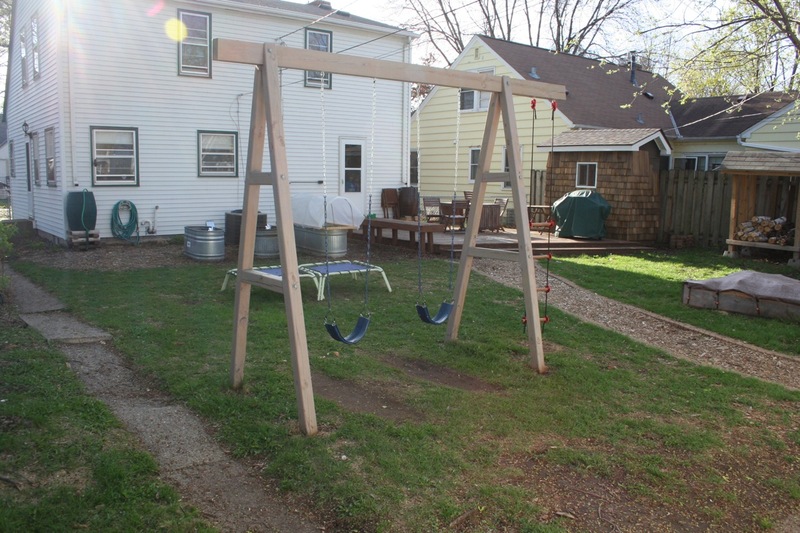 Part of me would really like to add an evergreen somewhere on the yard–perhaps a juniper? That decision is yet unmade. Two small columnar Chokeberry bushes are on the other side of the fence by the car. I’d rather not add any more shrubs over there because the area gets really piled up with snow during normal winters, and shrubs do not take kindly to having large amounts of shoveled snow thrown on them. 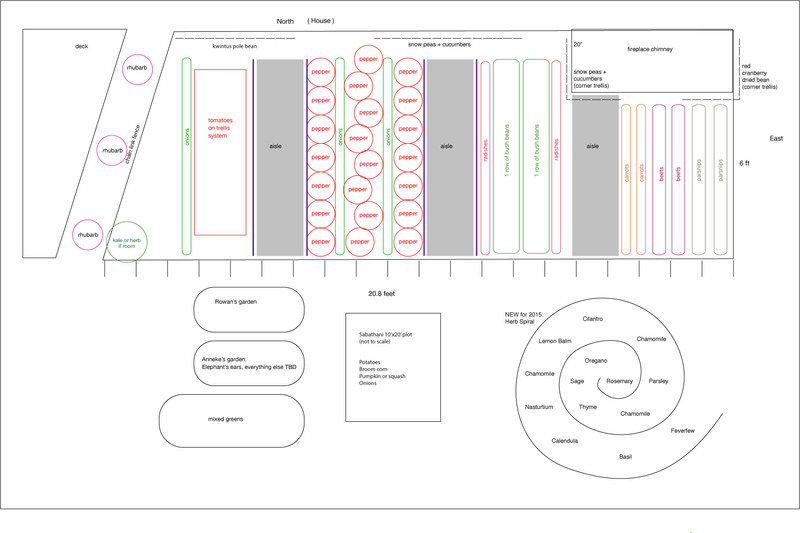 So there you have it: 2015 garden plans, ambitious as usual. But it’s so nice to have a stock of native volunteers in other areas of the yard to help fill these spaces in. What are your big plans/changes for 2015? 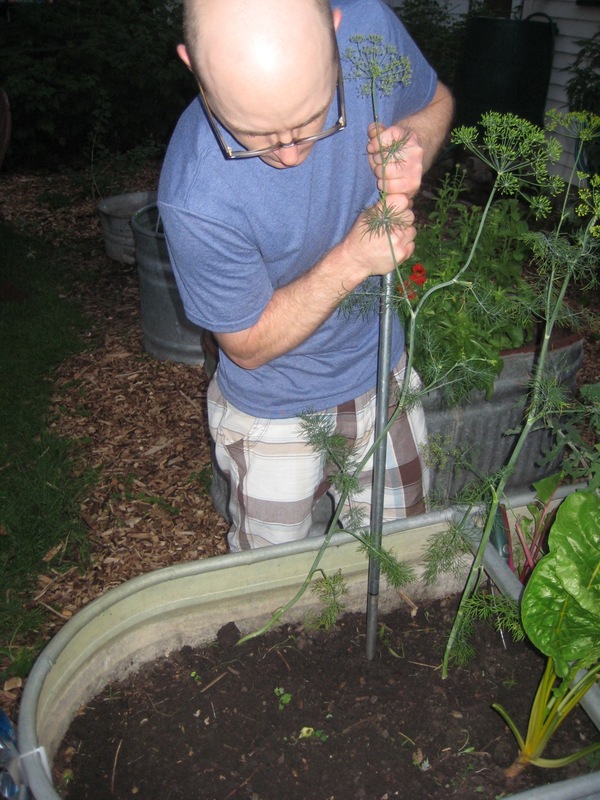 Categories: Gardening | Tags: edible landscaping, garlic, native plants, parsnips, tomatoes | Permalink. The first days of summer were marked by terrible weather–three nights in a row of severe thunderstorms that left much of the city (including us, for about 18 hours) without power. Trees are down everywhere. We were very lucky that we only lost a few branches. 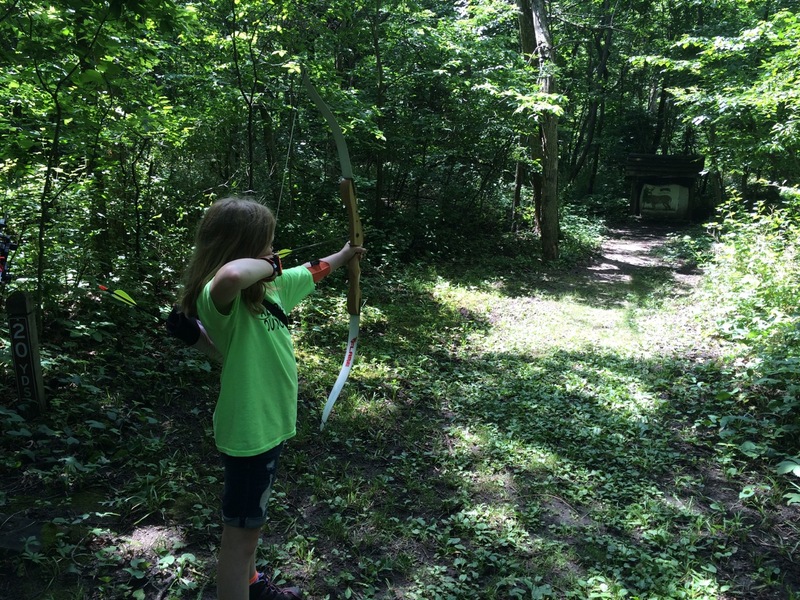 Despite that, the weather was nice during the day we were able to spend much of the weekend outside. We were sitting on the deck watching a monarch laying eggs on our milkweed Thursday night when suddenly, something in the letttuce/pea tank caught my eye. 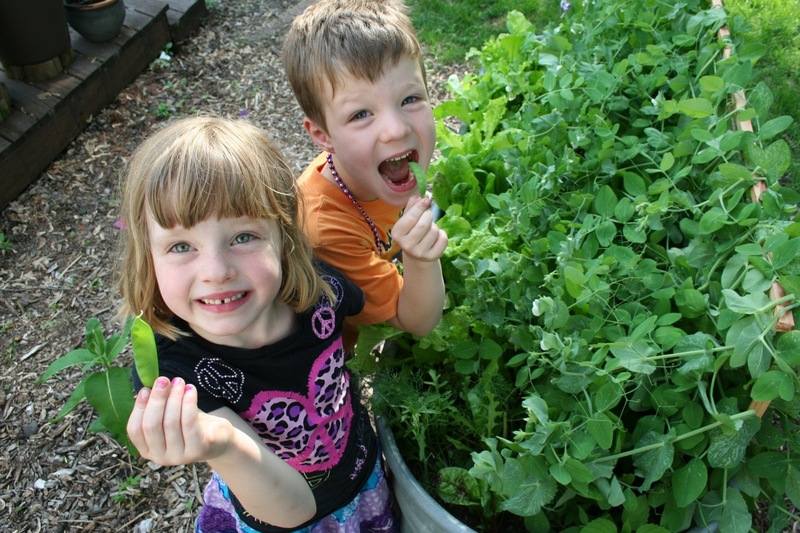 SNOW PEAS are ready! The kids have barely let us have any. I already know none will make it to the kitchen. I’ve eaten 3 or 4 of them, and only by sneaking. The flimsy twine support I made for them was completely insufficient and they are now laying on top of the lettuce, but no mind. Everything is still growing and very much edible. Things are going swimmingly in my deck container garden, too. I hope the broccoli doesn’t get a whole lot bigger… I may have crowded that a bit closer than is ideal. I will also have to thin out the basil soon. Here’s the whole garden. Rhubarb at the bottom. 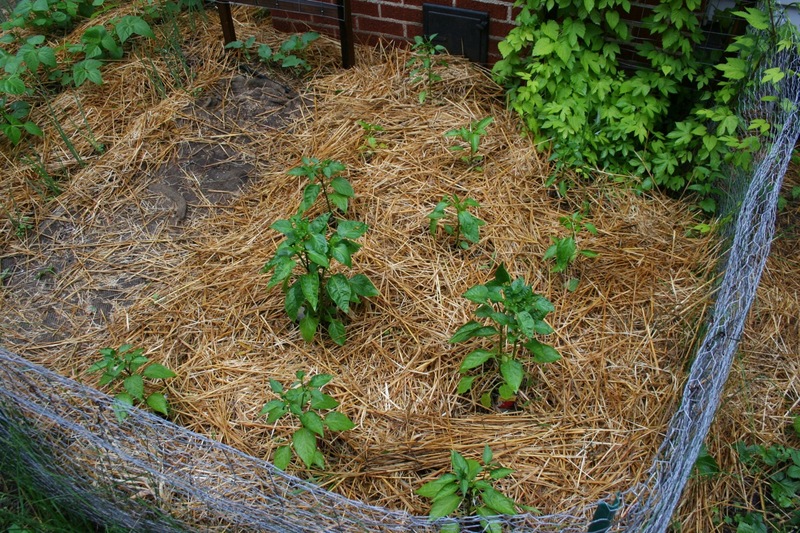 I added a fresh layer of straw last week, and there’s not much to do right now in here except harvest scallions, check the radishes and implore everything to grow faster. 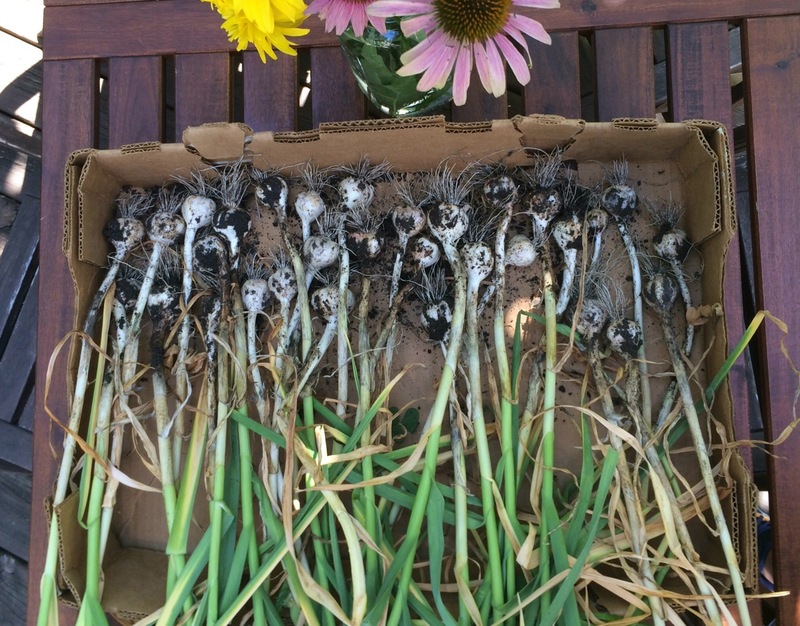 We also harvested our garlic scapes on 6/21. Taking it piece by piece, here are the peppers (mixed sweet and hot). I hope they get bigger soon; they have barely grown in the 6 weeks since I planted them. Behind them, as usual, the hops attempt to take over the house. At the trellis to the rear left, cucumbers are looking much healthier but still very small. 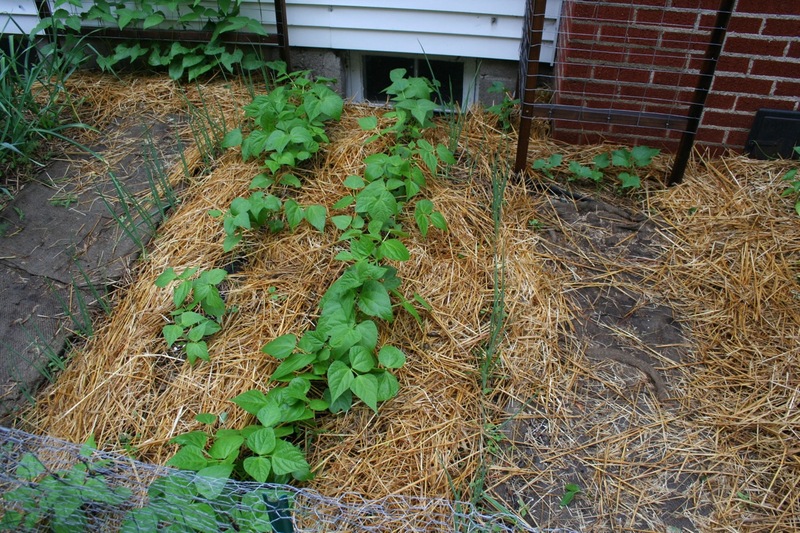 Bush beans (we had a bit of spotty germination), flanked by scallions. Cucumbers on trellis to the right, Christmas Limas on trellis to the left. I didn’t think about it until after I planted, but since both varieties of beans are open-pollinated, am I going to get cross-breeds? Maybe not. The bush beans are Blue Lake. Continuing on to the tomato and garlic area. 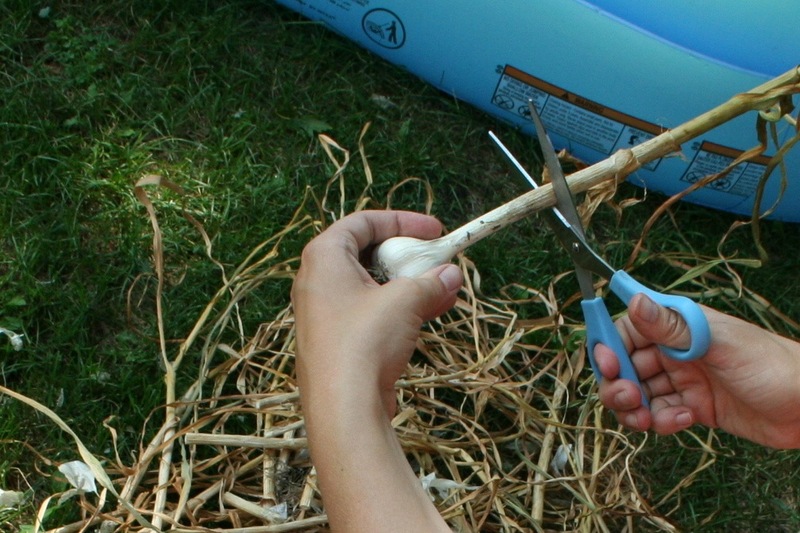 The garlic will be ready relatively soon, and I’ll be happy to get it out of the way. 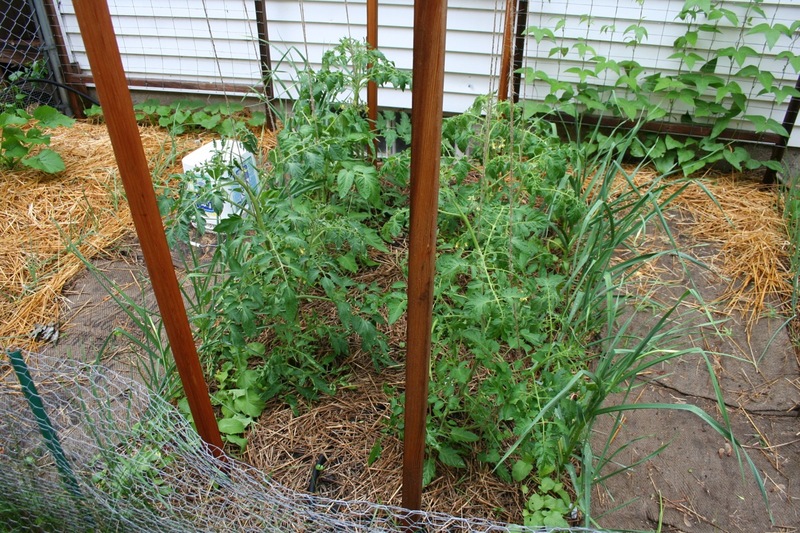 The tomatoes are growing rapidly right now, putting out blooms and tiny green tomatoes. I also *tried* to plant some radishes in here, between the garlic and tomatoes, but I think they are not getting quite enough direct sunlight. They just do not seem to want to produce a good-sized radish. Such a bummer; I should have planted them in with the beans, which were tiny for a very long time. I’m growing the following six varieties of heirloom tomatoes this year: Costoluto Genovese, Jaune Flamee, Moonglow, Nyagous, Brandywine, and Black Cherry. Finally in the last, odd-shaped west end of the garden, we have kale, some herbs (including a lot of chamomile), one hill of zucchini, some acorn squash at the trellis, and a row of shallots in the front. Here’s a view from further out. 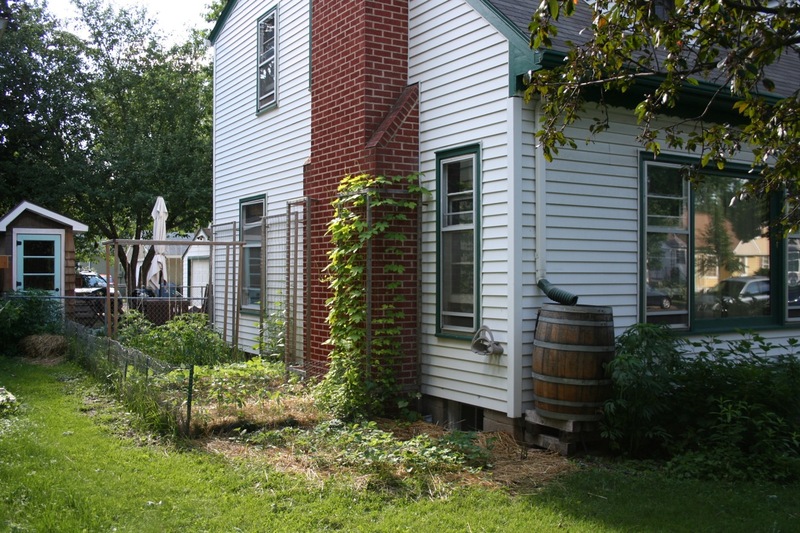 In the very front between the chimney and the rain barrel, I’ve been attempting to grow both asparagus and strawberries for several years. I’ve recently come to realize this is not working well. It’s simply not enough space to get a decent amount of either one. Especially the asparagus; we end up with about 5 spears every spring. And maintaining the strawberries means maintaining a constant war with the rabbits. 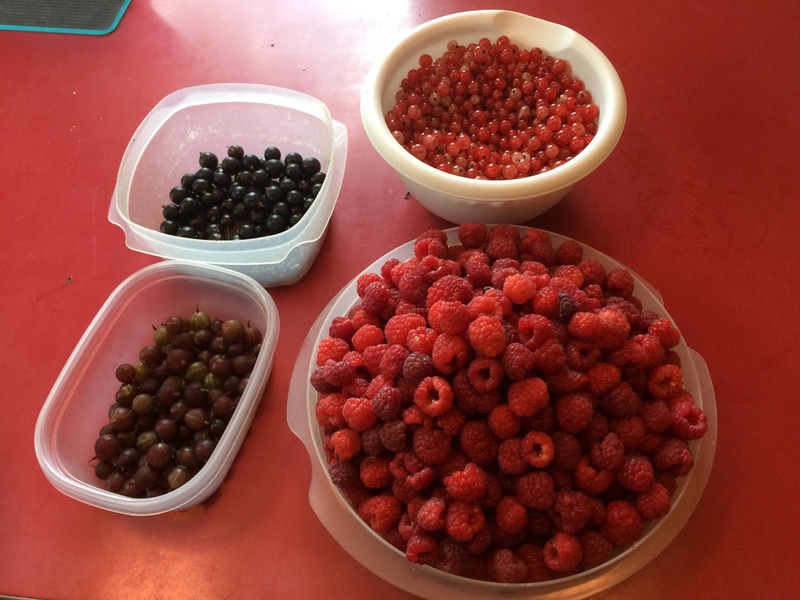 Meanwhile on the other side of the rain barrel, my currant bush just keeps putting out fruit, with less light, little care, and no rabbit damage. 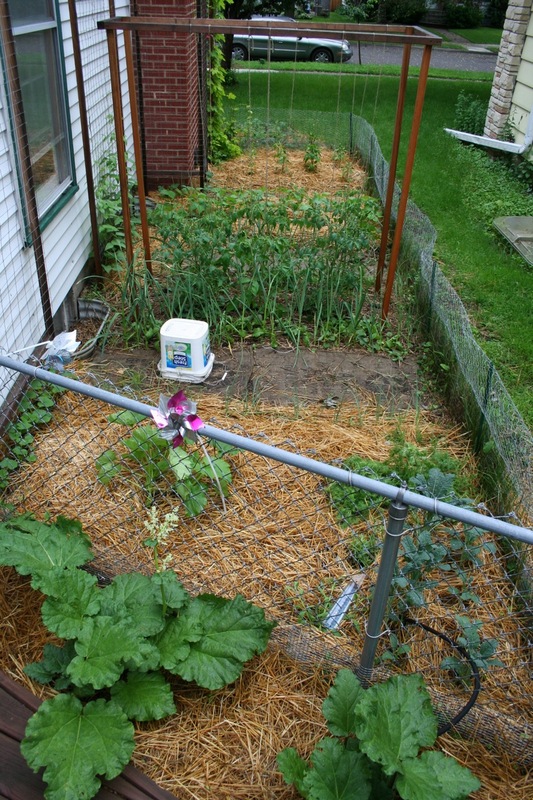 Categories: Gardening, Practical | Tags: edible landscaping, garlic, native plants, parenting, radishes | Permalink. Oh, how my plans have evolved over the years (2009, 2010, 2011, 2012). I’ve been very focused, the past two years, on trying to grow a GREAT variety of things in my garden, but now that I’m a more experienced gardener, I want a nice-sized crop. I’m no longer excited about having grown one single eggplant fruit. Give me at least 15 of something or forget it. With that in mind, I’m taking 2013 off from all brassicas and root vegetables in the main garden. I have had bad luck with both—brassicas due to their long growing season and root vegetables due to my very rocky soil. My main vegetable garden has a very short season due to the peak of my neighbor’s house. It blocks the sun in all but the highest summer weeks. I’ve also learned a lot about hoop house gardening, and this year will try to take my mini stock tank hoop house to the next level. With that in mind, I’m planting only very early spring things in March (weather permitting). These things will definitely be done by July 1 or so, when I will look to the fall and get greens and other such things started for fall harvests. My biggest lesson from 2012 in the stock tank was that I need to start the fall plantings earlier, giving them a chance to get good-sized before the cold and dark set in. 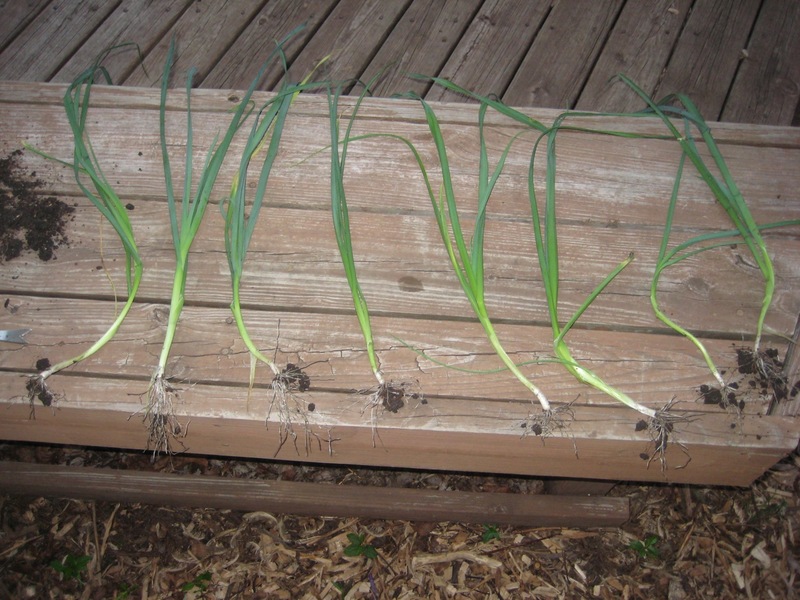 I grew both shallots and green onions from Mother Earth Gardens “starts” last year, and loved them. I plan to do that again. Garlic is already in the ground. I wish it had some insulating snow on top to protect it from the -20 degree F winds blowing over our area today, but… well hopefully it will be fine. 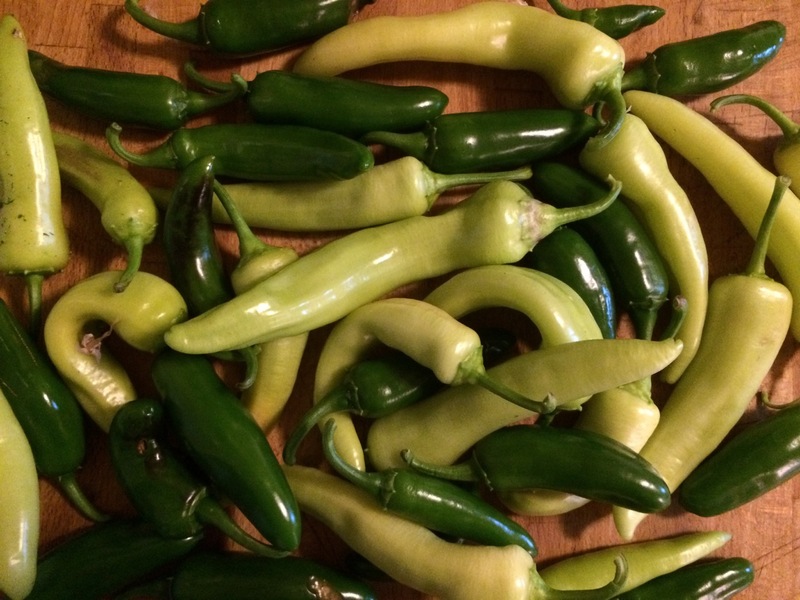 After pickling jalapeno peppers last summer and LOVING the result, I plan to grow quite a few more hot peppers this year. I’ve made room for 12 plants, and will get a variety of peppers when I make my annual pilgrimage. 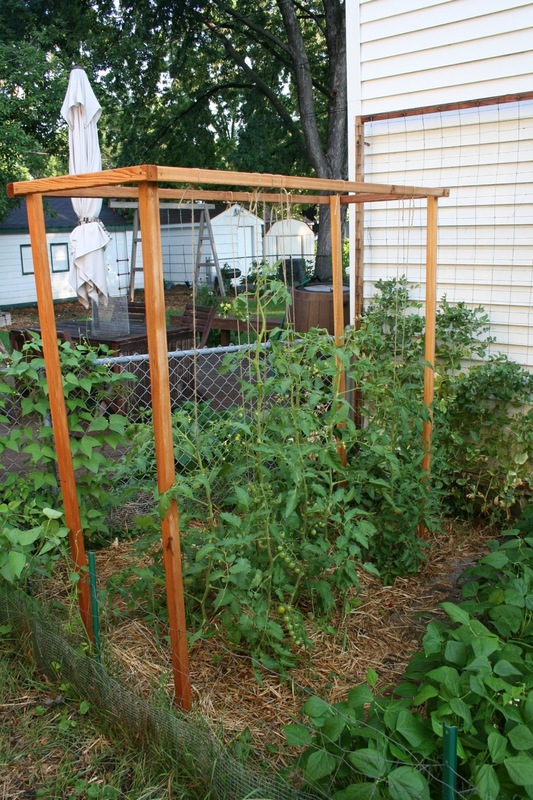 As for tomatoes, I’ll grow six plants again on the trellis, but will decide which varieties when the catalog arrives. I actually have quite a bit of seed leftover from last year when I apparently went completely insane with seed, so I’m going to re-use wherever possible (yes, many seeds are still viable after a year or two). 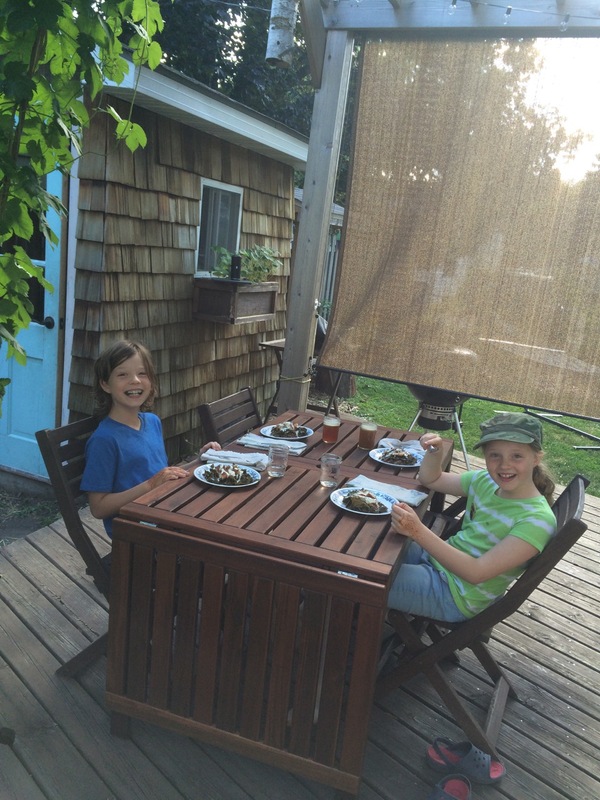 This means we’ll be enjoying “Maxibel Haricot Verts” again this summer–they are a spectacular bush green bean. I’m also letting go of trying to grow vegetables in Rowan and Anneke’s stock tanks. They simply don’t get enough sun for anything beyond nasturtiums. I’m going to let them each pick out a variety of shade-loving annual flowers this year, and I think some fairy gardens may sprout. My question for you: do you think acorn squash will work on a completely vertical trellis? Or am I dreaming too big? Categories: Gardening, Practical | Tags: beans, garlic, radishes | Permalink. It was less than half my 2011 harvest. I simply planted less of it last fall, having had no plan and no time to come up with one. Last September-October was a crazy time at work for me (it settled down, thank goodness). This is fun: I can now say, with confidence, that I know how much garlic is required to feed a family of 4 who really likes to cook with garlic. It is the precise amount that I planted in fall 2010 (~six 6-ft rows) and harvested in July 2011, one year ago. How do I know? 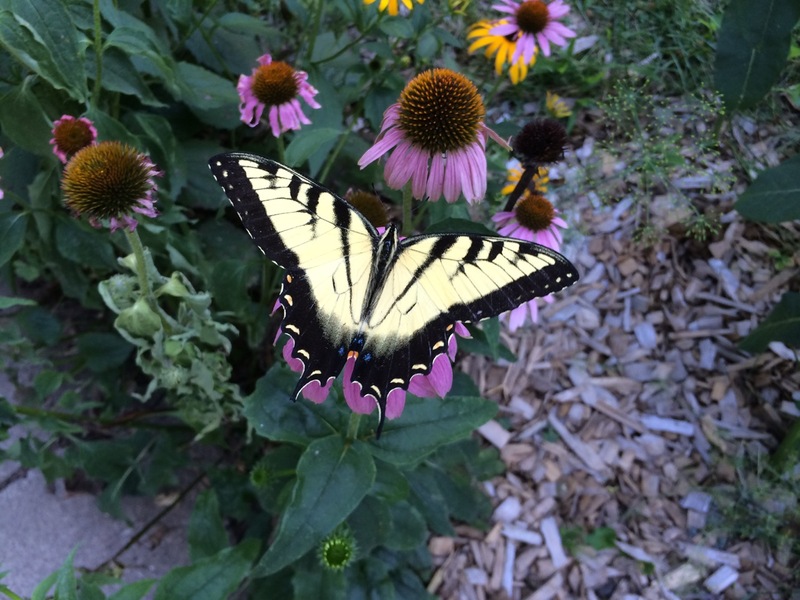 I had plenty on hand to plant for seed last October, gave some away as Christmas gifts, and had so much besides that it lasted until yesterday. Last night we took the last handful of bulbs and roasted them in foil on the grill for a few minutes, then spread them on slices of baguette. 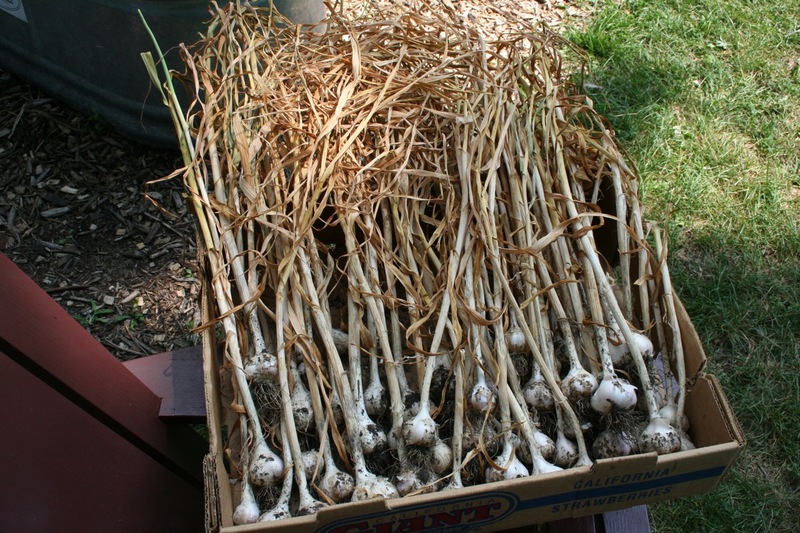 A heavenly end to the 2011 garlic harvest. You know it’s ready when the tops have turned completely brown and the smell has diminished somewhat. With a sharp scissors, cut the stem down to 3-4 inches. Cut off the roots, and brush the dry dirt off. Try to remove as few of the papery layers as possible. Cut yourself some longish lengths of string and tie each bulb to it as you finish cleaning it. 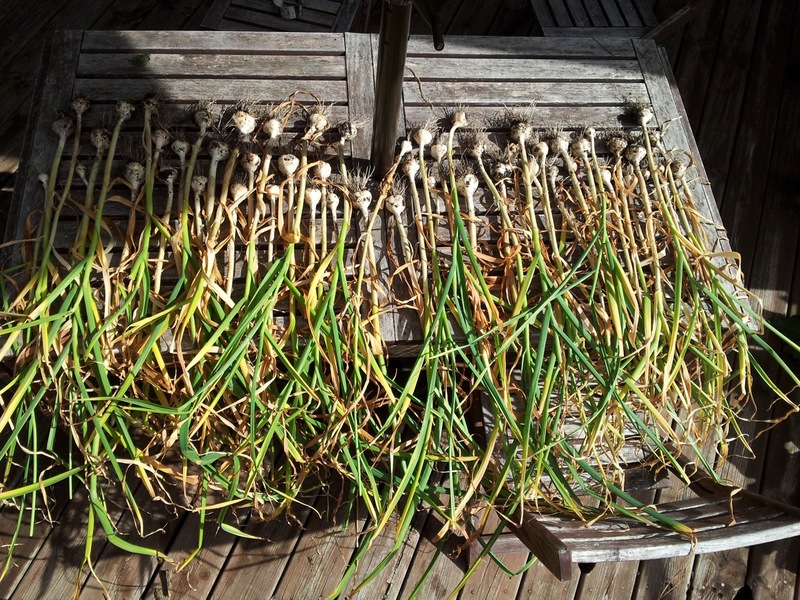 There you have it, our garlic harvest for 2012 (layed out neatly on the trampoline). The string on the top of the picture has all the damaged bulbs. We will use them first—they don’t last quite as long. At least half of each damaged bulb is definitely still usable, though. We hang them in a warm, dry place right in our kitchen, and we’ve now proven that they last a good year this way. 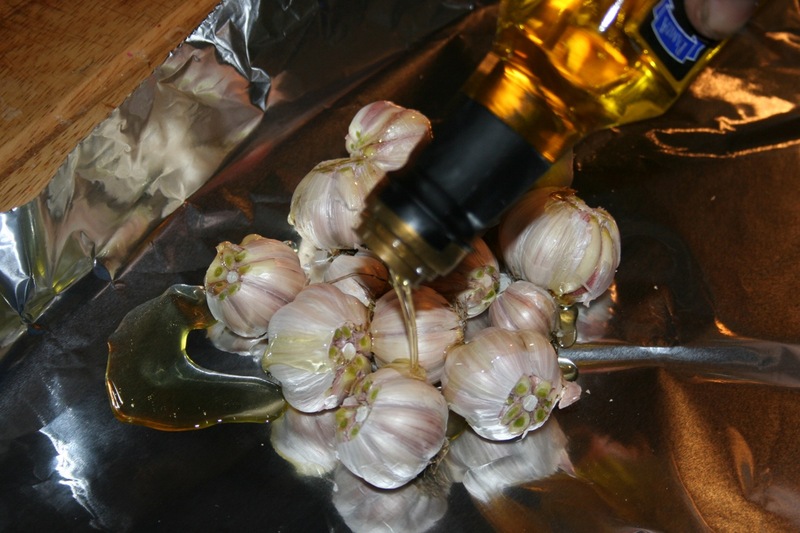 Categories: Cooking and baking, Gardening, Practical | Tags: garlic | Permalink. When you buy a leek at the grocery store it usually has a beautiful, long white stem. That’s achieved through a process called “blanching” and there are several different methods—most involve hilling up soil around the plant as it grows. 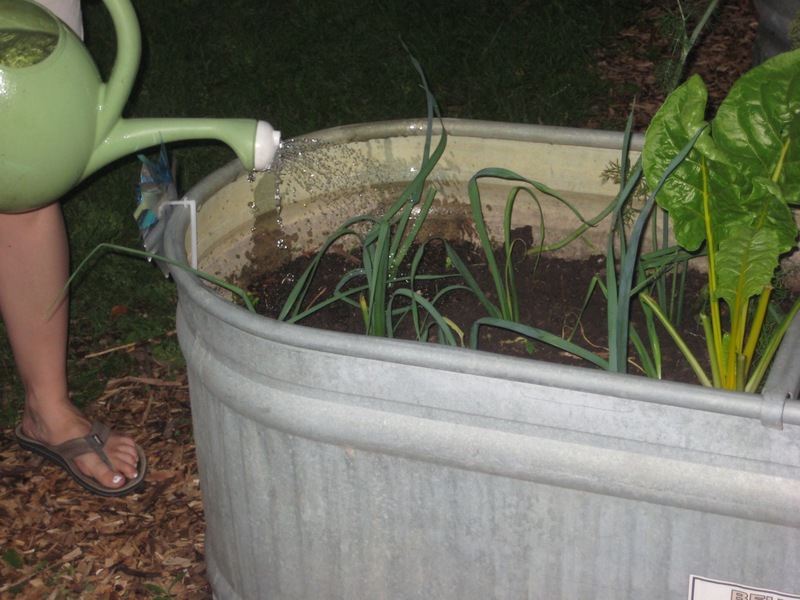 Some people put a 3- or 4-inch pipe around the leek to shade it as it grows upward. They were getting quite large—borderline too big for this. Also quite floppy, so it was definitely time to do something. Adam marked a line on an old piece of leftover conduit pipe. It pulled out a plug of soil to make a beautiful little 10 inch hole for each leek. We did not fill in the holes, per Coleman’s instructions. They will kinda fill in over time anyway. They needed a bit of extra water those first few days, but seem to be fine now. I also did this with another row of smaller leeks in the main garden. They seemed like they handled the transition better. The time is supposedly right when the leeks are about pencil width. These stock tank ones were a bit bigger than that — you can see how far they still stick up after transplanting them 10 inches deeper! We were out of town all last week, so we missed the start of high season by just a couple days. Fortunately we found a cousin who was eager to take us up on our offer of free pick-your-own berries. 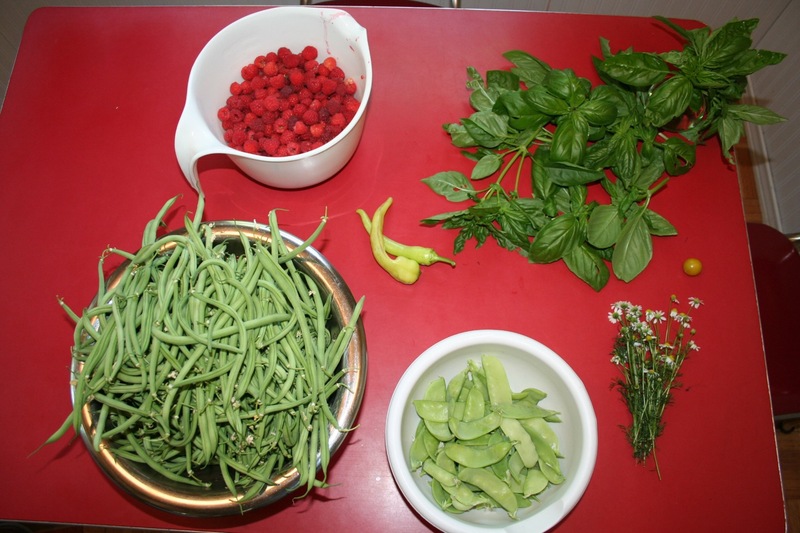 When we got back we immediately headed into the garden and picked a couple gallons of haricot verts. They are absolutely gorgeous, and magically delicious. Green beans and raspberries have been in just about every meal for 5 days now. Even more amazing are the banana peppers and one tiny cherry tomato. Never before have I harvested those in June. Yes, this was June 30, but still! What a year. Now as we head into the hot hot heat of summer, cukes (trellis to the right) and tomatoes (big structure at the back) are taking off. Our hops plant (on trellis on chimney) has reached the stage of total ridiculousness. There is no way Adam will use this many hops in his home brewing. Garlic is just about ready to harvest. 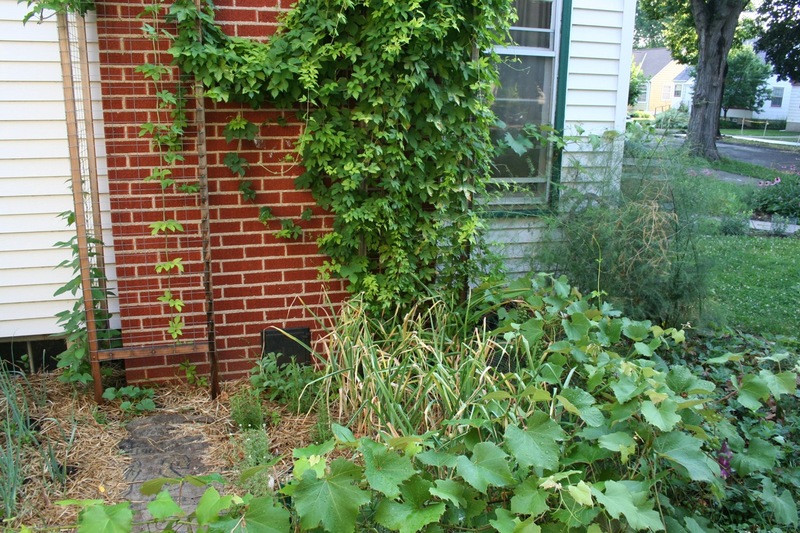 The grape plant on the rabbit fence is also a bit out of control—I want to move that next year, even though it will be a pain. 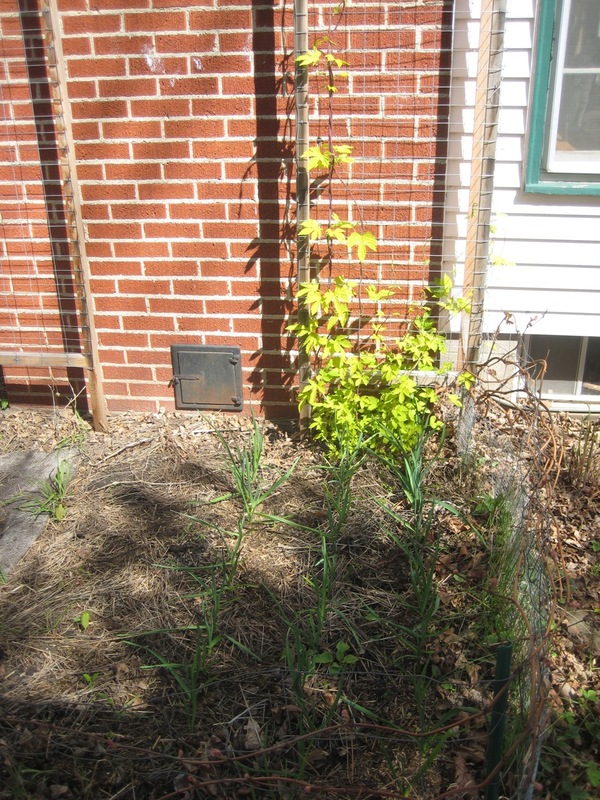 Even Master Gardeners definitely make mistakes with plant placement! Here’s a close-up view of my tomato trellis. I’m on track to have my best tomato season ever (knock on wood). Maintaining it has been easier than I expected. Make sure you check on your plants about 2 times per week to remove suckers and make sure the string is wrapped around new growth. I’ve also added a few more pieces of twine for branches that seem to need it. Whew, busy times! And hot. 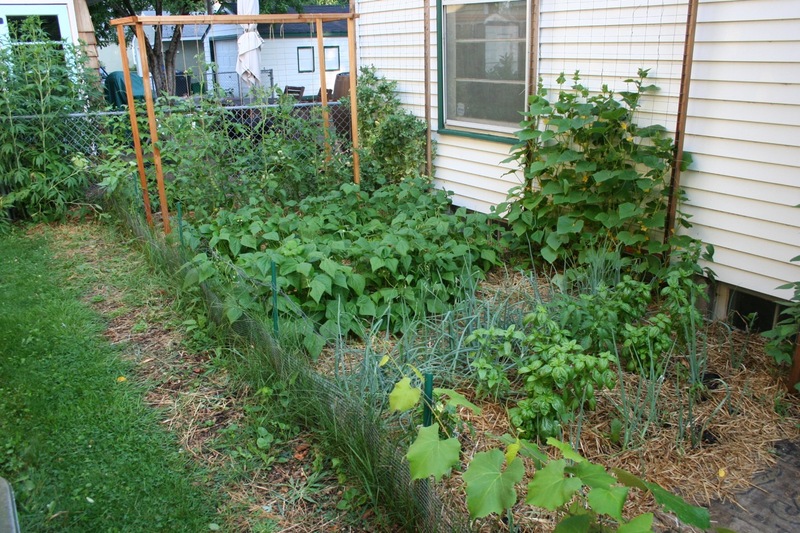 Categories: Gardening, Practical | Tags: beans, edible landscaping, garlic, leeks, raspberries, tomatoes | Permalink. Sugar snap peas! Coming right along. Hopefully we’ll be eating them in May. Three rows of garlic, and hops climbing up the trellis. I am a little frightened at how huge this hops plant is already, only one year after I originally planted it. French sorrel. 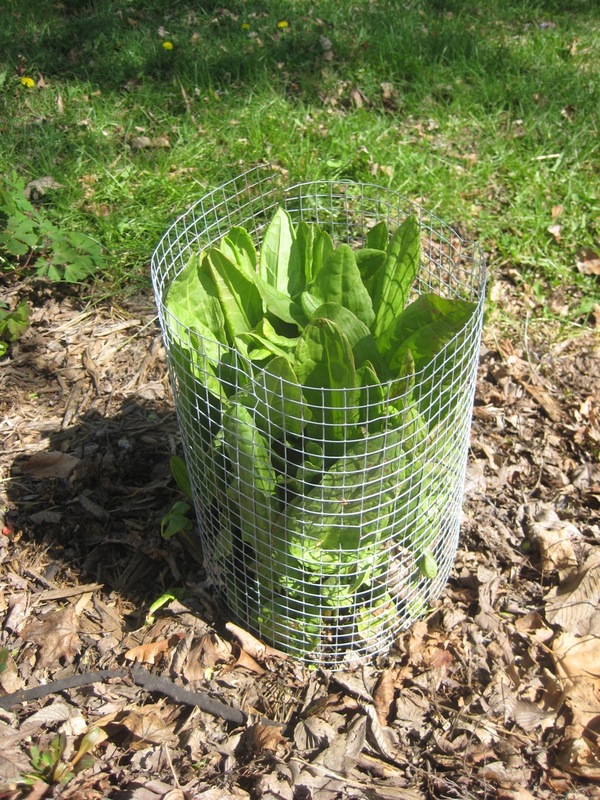 As soon as it started poking through the leaf mulch a few weeks ago, I put this rabbit-resistant (note: not rabbit-proof) cage around it. Since then I’ve been begging Adam for sorrel soup. He said, “When the basket is full, I will make soup.” I think this is my week! I’ll even post a recipe for you. 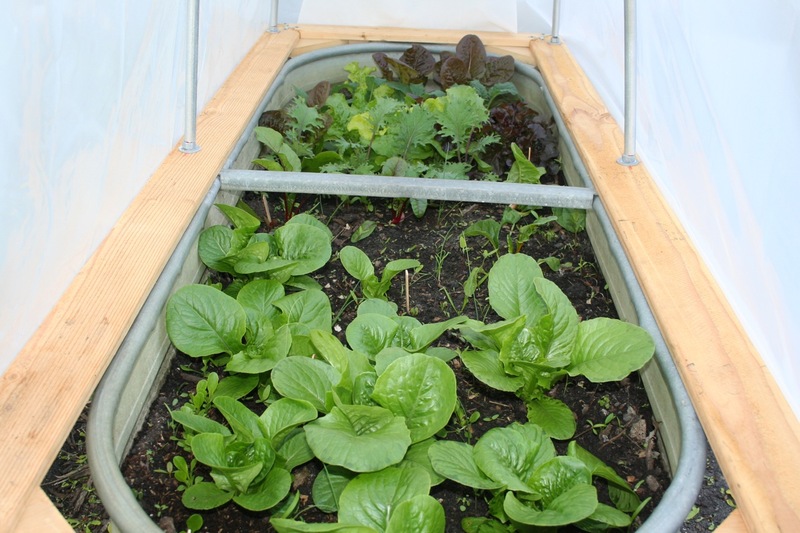 Look how great my lettuce is doing in the mini hoop house / stock tank garden! 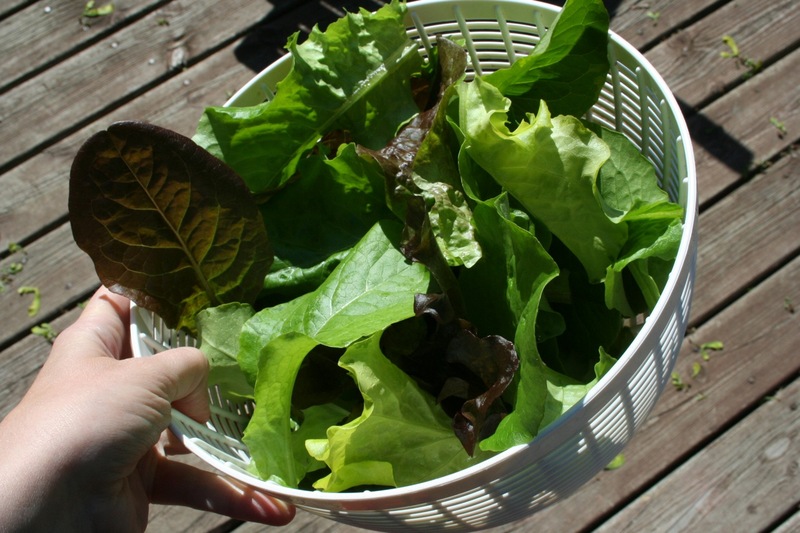 First lettuce harvest of 2012 was Wednesday, April 11. A personal record early harvest. I harvested my first kale and chard today for a quiche. And finally, an uninspiring picture of our back yard. This was from a series of pictures I took last week to begin documenting our back yard landscape transformation project that has just begun. The sidewalk on the lower left has already been removed. Thanks to craigslist, we were able to recycle all the old concrete and didn’t have to pay for a dumpster. Excellent. 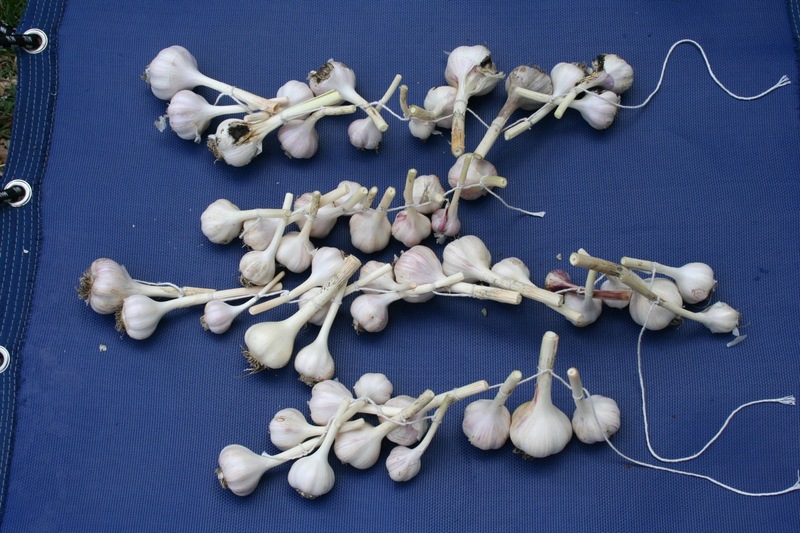 Categories: Gardening, Practical | Tags: edible landscaping, garlic | Permalink.